Los Angles, CA—Gregory Powell is an exceptionally gifted paralegal, classy sounding gentleman and a frightening cold-blooded cop killer. He’s 76 years old and in failing health. Powell was a career criminal and a total waste of good sperm. Powell escaped the death penalty and is currently serving one of those life sentences that do not necessarily mean life. On October 18 Powell will face a California Parole board and with any luck he will get the same result he got a year ago, more tasty prison gruel. Actor James Woods played Powell in the film based on Joe Wambaugh’s best selling book. Woods should have won an Academy award for his performance. Although the film was well-done and accurate, Powell blames the film on keeping him locked up nearly three decades longer than he would have had the film not been made and released. I’m sure he’s right. 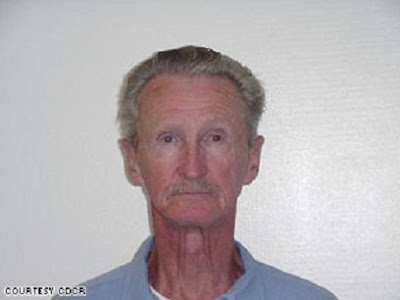 Fellow killer and partner Jimmy Smith was somehow let out in 1983 only to repeatedly reoffend and put back behind bars. Finally in April of 2007 in custody at the Pitchess Detention Center in Castaic, California he died of an apparent heart attack at age 76. Powell was considered the mastermind and has yet to see the light of day outside prison. There is little doubt that he’s not the man he was in 1963 and that prison has refined and educated him in the nearly 50 years he’s been caged. Powell is also a gifted writer that should be publishing books but has not chosen that vocation. I could support parole for Powell if he was totally disabled and incapable of leaving his nursing home alone. Frankly this is about the savage kidnapping, murder of one cop, Ian Campbell and the attempt to kill the other policeman, Karl Hettinger. Powell has managed to outlive nearly everyone ever connected to that infamous case. He may already be the last man standing. Powell is one fellow that earned every bit of his punishment in spades. As much as I hate the death penalty I’d have found satisfaction had he sucked lethal gas at San Quentin like he deserved. I might be tempted to attend that parole hearing and bring my video camera if someone sponsored my trip. I’d love to post the entire hearing on this blog. Saw your friend Dennis farina has a new film out "Last Rites of Joe May' with rave reviews. You see it? Most of todays hair gel police do not even know what Onion Field insurance is. Just watched the Onion Field on NetFlix a few weeks ago. Read the book in the 70's. This guy with his giraffe neck should rot in prison until he dies for what he did. Strange as it is, gregorys father was my band teacher from 4-8th grade Carlsbad school district CA after this happened. From what I remember back then of what people said; he was always a troubled kid.